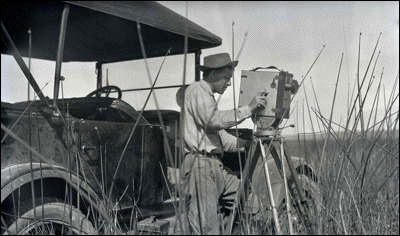 In May of 1908, Oregon biologist, wildlife photographer and writer William L. Finley made a trek with his friend Herman T. Bohlman into the desert country around Malheur Lake. 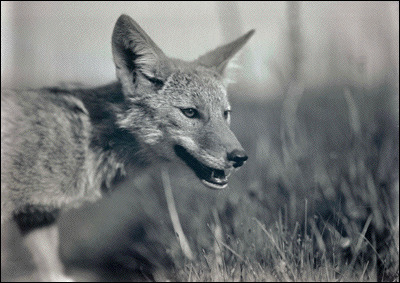 Finley wrote in his notes: "The real animal of the locality, the rogue, the rascal and the robber, that I can't help but admire, is the coyote." We had started out across the high desert early in the morning. The road had led on to nowhere, until suddenly it turned down a dry wash hemmed in with rimrocks. Rounding a point, we startled a coyote hunting for jack-rabbits. He leaped the rock wall and bounded away up the slope, dodging in and out among the sagebrushes as if he expected to hear the spat of a bullet. Nothing happened, so he stopped near the top of the rise, curious to see who had invaded his hunting ground. 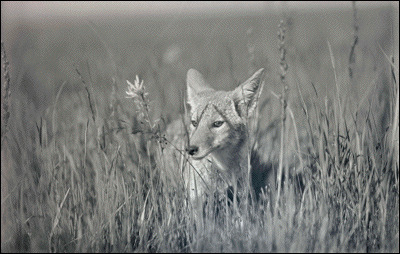 That evening as we sat around the camp-fire, we heard the song of the coyote. It is a series of short barks, increasing in power and pitch until it ends in a long wail. Almost immediately another joined in the chorus from somewhere in the dark. One might have thought there were several coyotes. 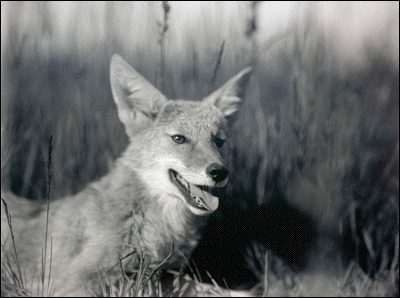 The coyote or prairie wolf is just a keen wild dog that wanders around and lives a sort of vagabond life. He has no friends. He depends upon his wits to outstrip others -- and man. With an eternal bounty upon his head, he is a happy-go-lucky rover living along the border land of civilization. His fox-like nose and ears seems to be a sign of his cunning. 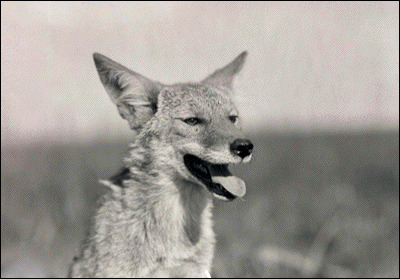 When the coyote was first discovered he was given the scientific name, Latrans (the barker), because he is the only one of the tribe that barks habitually. His voice is a remarkable gift, like the epic songs of the cowboys. 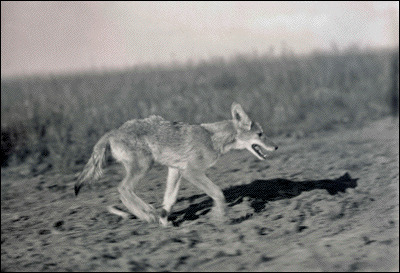 In the western states, the numerous jack-rabbits make up his average diet. 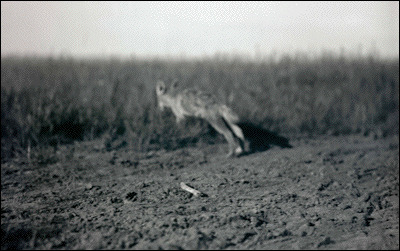 When hunting jacks, a pair of coyotes will work together, using their cunning against the dumb bunny. 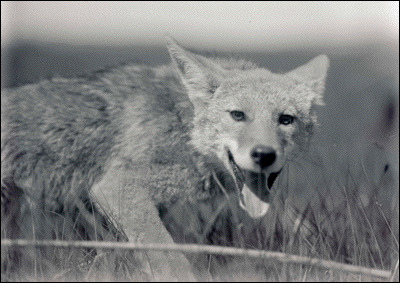 The coyote is perhaps the one wild animal of the western country too keen to be exterminated by the modern methods of man. 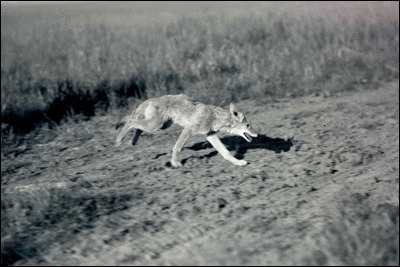 The coyote knows he is always on the firing line. Experience with man has taught him all the tricks of the trade. His sharp wits, developed by this experience, hold a scanty but steady balance in coyoteland.